I’m a proud mother of 4 (9,7,6, and 2). We’ve lived in Hawai’i in since 2012 with the exception of a quick 10 months in Oregon. Having lived all over the U.S., it’s easy for me to say the islands have my (and my family’s) heart. 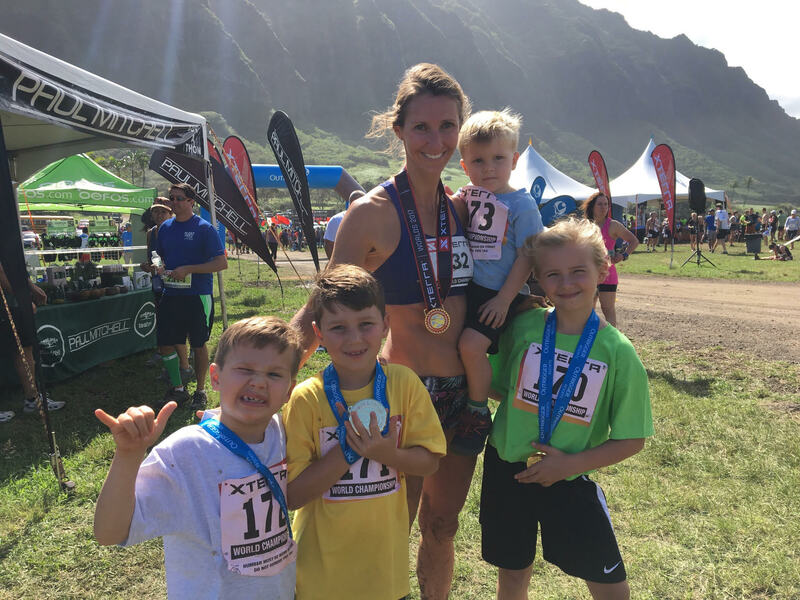 My 4 Keiki keep me busy but I truly enjoy running as part of my limited “me” time. I’ve loved running for about as long as I can remember. I was fortunate enough to run in a great high school program in New Hampshire which ultimately landed me at Georgetown, running for the Hoyas. I’ll spare the inclusion of my more youthful PRs as those are not distances I run anymore. In recent years, my PR for the half marathon was running for Team Hawai’i in “The Chase” during the Hapalua: 1:23. While living in Oregon this past year, I couldn’t pass up the opportunity for running a marathon in Tracktown U.S.A. so I ran my first (and presently only) marathon in 3:04. What are your future racing plans and running goals? Looking forward to 2018 with plans to complete at the GAR, Rainbow Ekiden and Hapalua as part of Team Hawai’i. Currently I’m working with Michael on follow-on plans. My major goals are to continue enjoying the sport, training for races that get me excited, and keeping my body injury free! XC Nationals, Hood-to-Coast Relay, some HURT Series races, and another stab at a Marathon. The ones that are successfully completed;)! Pre-race: my husband’s “healthy-made” fettuccini alfredo with meatballs or brussel sprouts. Post-race: IPA and a burger although who says you have to wait for a race to enjoy that?! Ube ice cream from Dave’s in Waimanalo – the best! In Hawai’i, gotta have my trucker cap and/or sunglasses. Still working on what nutrition works best for me – I like coffee flavored gels with caffeine before early morning workouts. For any race/workout – definitely a vanilla flavored recovery drink. I was fortunate to run under some great coaches and accompanying programs in both High School and Georgetown. Post-college, training had always been sporadic and not focused. HRL has provided me with a program and accountability that makes my running productive, re-focused, and most importantly FUN! HRL gives me the flexibility I need as a mother of four but enough direction to ensure my limited “free” time is utilized efficiently to the maximum extent possible.